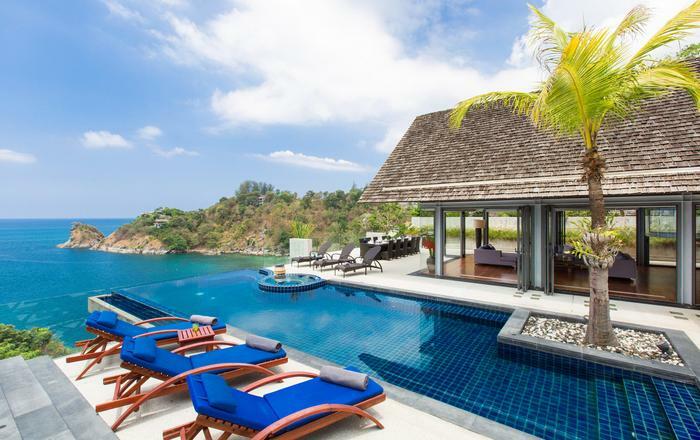 Undeniably beautiful, Villa Kalyana is an exclusive beachfront estate on a private bay on Koh Samui's idyllic south shore. 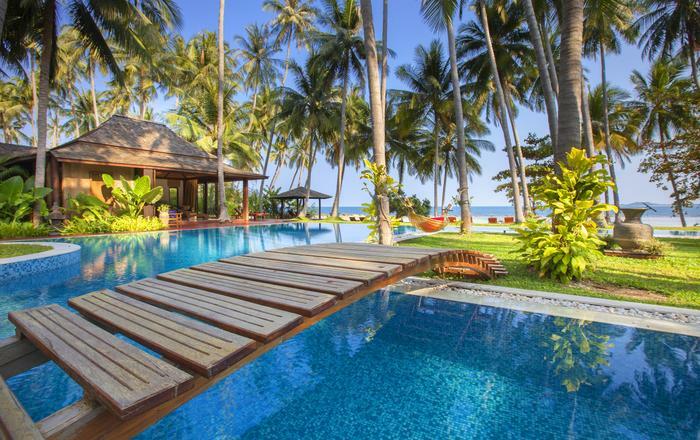 This lush palm tree plantation, fringed by the icing sugar sands and clear turquoise waters of the Gulf of Siam, sets the surroundings for this unforgettable villa. 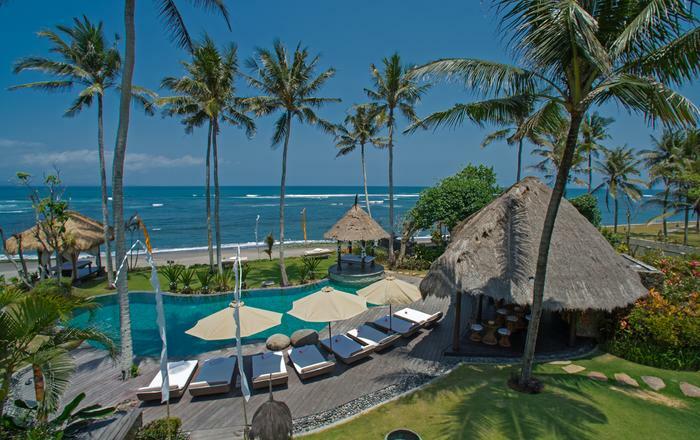 Ideal for large parties the villa has a total living area of more than 1500sqm on over 5000sqm of land including 40 meter of private beachfront and a 300sqm private pool. 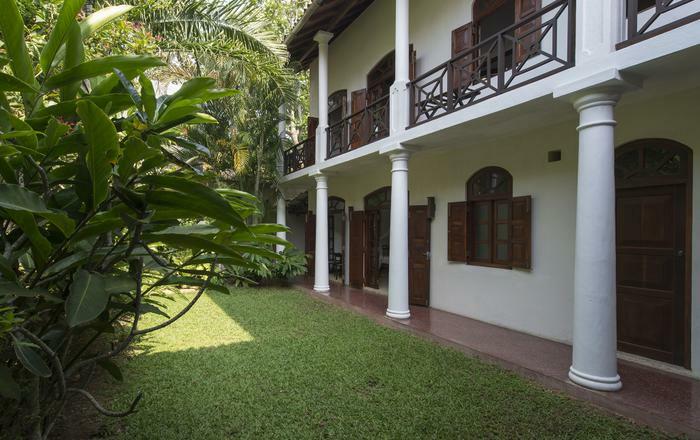 Villa Kalyana features 24 bedrooms and two free bunk bedroom for children within the main grounds and another 4 individual, adjacent beach bungalows with their own 250sqm pool. 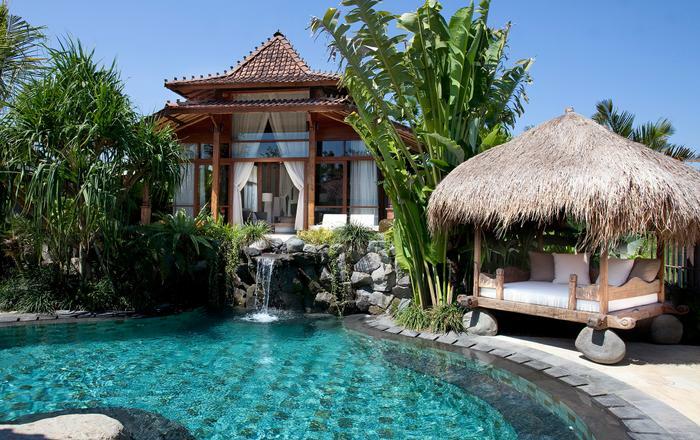 The villa can therefore accommodate up to 40 guests including a maximum of 12 extra beds. All rooms have ensuite bathrooms, sea views, minibars, private terrace areas, desks, sofas, walk-through wardrobes and floor-to-ceiling sliding doors leading to the decks and garden. The Kid's room has an adjoining adult's room, bright coloured wallpaper, large beanbags, baskets of toys and a Wii making it the perfect indoor playroom. The Villa is fully equipped with all the modern technology, including 11 flat screen TVs from 30” to 65" and a HD video projection in the cinema room. There is also a spa/massage area, fitness suite and entertainment room with bar and snooker table. For meal times the large dining area is equipped with a massive wooden table seating 22 persons, a European breakfast kitchen, a bar and a chill out area. Directly connected is an outdoor barbecue terrace for the ultimate alfresco dining experience. 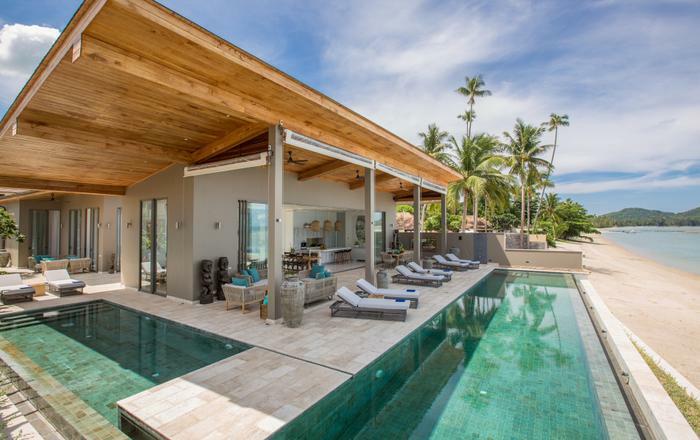 When entering the villa for the first time you'll be immediately impressed by the huge covered terrace and lounge area which includes a 250 year old hand-carved wooden Sala floating above a water basin. 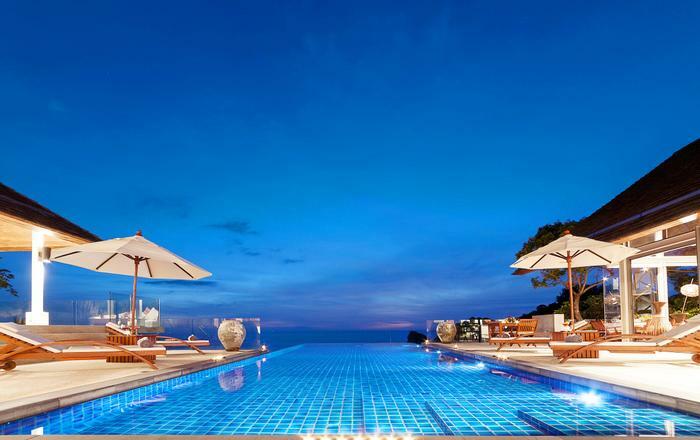 As you follow this through you will come to the lush tropical gardens, bungalows and immense pool all drenched in the alluring sea views beyond. Family-friendly advantages of villa stays include having access to your own private facilities, such as a swimming pool, living space and gardens and having the freedom to use them whenever you want. Knowing that the kids can run around happily, independently and safely, without you having to worry about other guests, is a real bonus and one that means parents are certain to have a more relaxed holiday too. With the incredible open garden spaces unfolding seamlessly to the pool terraces and golden sandy beach beyond Villa Kalyana is the ultimate kiddy playground. Villa Kalyana has 10 full time staff to ensure that every possible convenience is met; there is a European Guest Host, Thai Villa Manageress, Thai Chef, 3 maids, driver, and 3 gardeners. The Host can arrange all kinds of activities for a small extra charge, such as cars, motorbikes, jet skis, boats, canoes, snorkelling equipment and mountain bikes. This will be the essence of a holiday you will never forget! I have celebrated my wedding in villa kalyana 1. This place is simply amazing. When you arrive there, you become speechless. The traditional design and furniture make you feeling great immediately. 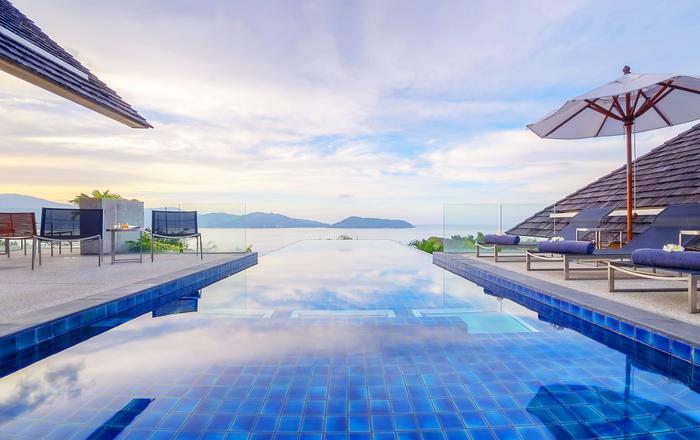 Just look forward and you will see this amazing pool with a small island in the middle and then a private beach accessible only for this villa and the neighbors also. The Belgium manager Renaud will always be there for you whatever your request. He is a very nice and gentle men. We appreciate the way he help us to organise our wedding by ourselves. We definitely had the best day of our life there. Whatever the minor problem you can have Peter the owner will deal it in a very professional manner. Hurry up if you want to have a chance to get availability! 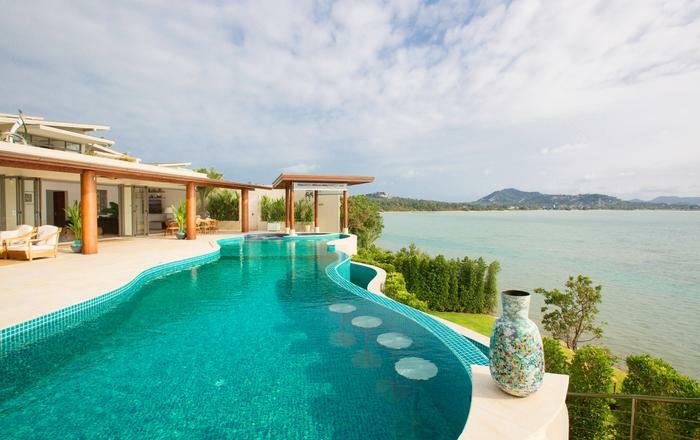 This villa is really busy as its probably the biggest and nicest private villa in Koh Samui! Rates are for the number of double bedrooms and the FREE use of the bunk bedroom which sleeps 4 children. Rates include full time Thai Chef service. Food cost and provisioning fee on guest account. Airport Transfers charge of USD 50 is applicable, subject to 10% service charge. Charges for airport transfer are applicable per trip and for a maximum of 12 passengers per vehicle (private mini bus or luxury car). Events premium is due upon balance payment for the accommodation. Premium are for 24hours and additional event premium may be applicable for subsequent parties. Minimum number of nights as per season's schedule is applicable. A refundable damage deposit of US$ 2,500 (THB75,000) is required to cover any potential damage, payable on site. A cleaning fee of up to US$350 may be charged on site to the Guests in case the service of a professional cleaning company is required. Venue premium and other related cost are not commissionable. If it becomes necessary to cancel all or any part of the booking, Villa Kalyana must be notified in writing (email acceptable). The following cancellation charges will be applicable depending on when the notification of the cancellation is received in writing and the period of stay in the Villa. Any change to the original reservation is subject to the approval of Villa Kalyana. Early departure penalty will be subject to negotiation with our Manager on Koh Samui. At least 180 days before check in, we refund 80 % of the paid deposit, or credit the whole deposit (100%) for another booking within the next 12 months from the date of the cancellation confirmation. Between 179 days and 90 days, we refund 50 % of the deposit or credit 90% of the deposit for another booking within the next 12 months. Between 89 and 60 days before check in, we refund 20 % of the deposit or credit 80% of the deposit for another booking within the next 12 months. Between 59 days and 40 days before check in there is no more refund, but still the possibility of crediting 70 % of all paid funds for 12 months. If you cancel less than 40 days before check in, a full or partial refund is solely applicable shall Villa Kalyana secure a reservation fully or partially covering the initial cancelled reservation. All credits can be used by the client or anyone on their behalf. For any cancellation after the deposit and/or balance payment. All payments are forfeited and a full or partial refund is solely applicable if Villa Kalyana secures a reservation partially or fully covering the initial and cancelled reservation. The above cancellation charges also apply if Villa Kalyana cancels the booking due to non-payment of the balance. If the dates of the booking require to be amended, this may be treated as a cancellation of the original booking and cancellation charges may apply.